3 tracks for an all Techno EP with the 90’s taste. TR 909, Industrial noises, metallic anvils and distorted pads are the elements that create the sound of George Lanham. His English style underline the 90’s concept, the musical power of industrial machines sound and mechanical gears within a total atmosphere of darkness. A sound of a world genetically modified. A perfect sound track for a science movie, ‘Tetsuo’ for instance. 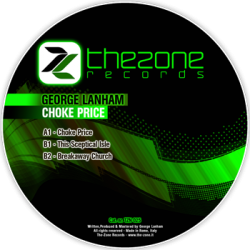 ”Choke Price” make us think at one of the most cult techno production of London entitled ”We have arrived” made by Mescalinum United and then remixed by Aphex Twin, where industrial pads and metallic anvils give the imagine of working robots. In ”Breakaway Church” and ” This Sceptical Isle” distortion kicks, mechanical gear samples and hypnotics snares sound like car’s pistons make us think at the industrial production of The Mover and to Robert Armani’s techno. An Ep that relieve the emotions of the big techno revolution of the 90’s.